In the healthcare industry, the most innovative organizations are adopting the cloud in order to provide fast growth, flexibility, and better performance. Health Choice Network (HCN), a Florida-based non-profit Health Center Controlled Network (HCCN), and one of the largest safety-net provider networks in the U.S adopted Citrix Cloud. As a result, over 1,400 clinicians can now deliver faster and more secure access to electronic health records and other mission-critical applications from any location on any device at their convenience. 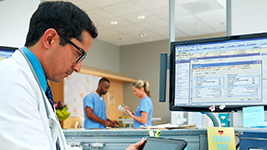 HCN provides secure digital workspaces to clinical care teams via Citrix Cloud. By providing a single platform to securely deploy and manage all apps and data, Citrix has made it possible for HCN to build an infrastructure that will allow IT staff more time to focus on the needs of HCN’s member centers and less time on routine maintenance. By giving all member centers access to a virtual workspace in the cloud, member centers will have instant access to patient information as they move across facilities, devices and networks. In fact, initial test results during HCN’s pilot phase proved that end-user logon times were reduced on average by 30 seconds when using Citrix Cloud, allowing physicians to spend more time in front of their patients instead of a computer screen. For member centers that depend on controlling costs and typically employ smaller IT staffs, access to a virtual workspace in the cloud can be an important tool in providing quality, on-demand patient care while overcoming IT resource constraints such as budget, staffing and skills limitations. Citrix believes in HCN’s mission to deliver technology solutions to improve health outcomes. As a result, Citrix has become a Patron of HCN by committing to make an annual contribution that will help provide support needed to keep HCN’s member centers focused on their mission of making quality health care more accessible.